Ah, the world wide web. A place where, knowing your success can hinge on your social media presence, it is very easy to feel like a small fish in a big pond. If you are feeling overwhelmed at the prospect of building an internet following, don’t resign yourself to ‘minnow’ status just yet; there are plenty of applications designed to help you market yourself to the world. We are here to give you the lowdown on our top ten tools to improve your Instagram’s popularity and boost your business, personal brand or just your own personal accounts. Wait, you might be thinking, Instagram? 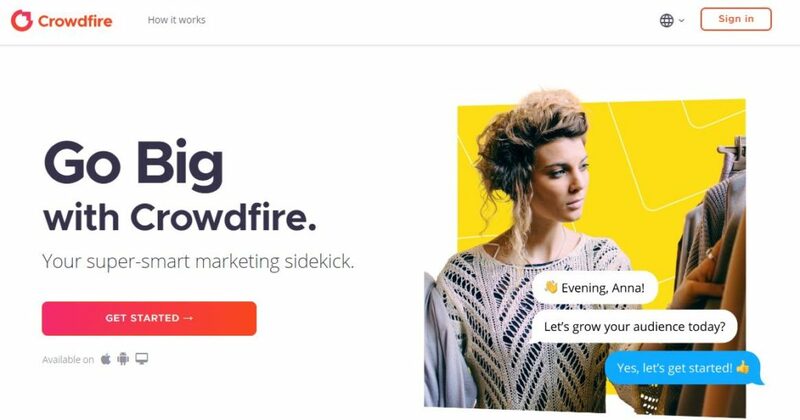 Yes, the site once famous for viral photos and teenage girls flashing their best duck face has become an excellent tool for networking, marketing, and even for selling products. Note: All links on this page are affiliate links which basically means that we receive a small commission when someone signs up to a paid plan. This helps us run this website and keeps all the guides, tutorials and resources free to use. Figuring what to post, who to follow, what hashtags to use, and even when to upload content can be a vital part of connecting with the right audience. Since it is not exactly practical to while away your days scouring Instagram for trends and blindly following people in the hopes that they will follow you back, let’s take a look at some tools that do the heavy lifting for you. A popular leader among social media management tools and one that is a real contender to Hootsuite’s throne, Sendible provides you with the ability to run accounts on different platforms (e.g. Facebook, Twitter, Instagram, and others) from one convenient dashboard. You can schedule posts, easily manage and track collaborative projects among your employees, and streamline the way you receive feedback from your posts. Sendible is unique in several ways, the most notable being the array of social media platforms with which you can connect. Aside from Instagram, you will be able to access Twitter, Facebook, LinkedIn, Tumblr, WordPress, and numerous others, from the dashboard. Sendible also shines in how it works with other online programs. For example, its collaboration with Canva allows you to design and post your unique creations seamlessly. Connecting your Instagram and other social media accounts to this online tool is a quick and straightforward process. After clicking the appropriate icon, you will be prompted to enter in some basic information, and then you are off to the internet races. Once you have all of your accounts linked to Sendible’s dash, your online world will open up. This tool can generate detailed analytics reports within minutes, while some other applications can take an hour or more. Whether you are creating reports for clients or for your own personal reference, Sendible can tell you how many people you are reaching, which posts are your most popular, the rate of the growth of your audience, and even determine the optimal time to post content during the day. You can generate reports for each account individually, as well as get the statistics for all your social media accounts combined. Sendible has the best instagram scheduler tool on the market, bar none, so be sure to check it out on the free trial. All in all, Sendible is pretty great if you are looking for one-stop shopping for managing your online profiles and not just an Instagram scheduler. Instagram has been quite restrictive about allowing third-party tools schedule posts, but Sendible makes it as simple as possible. In January 2018, Instagram launched a new feature, allowing Facebook Marketing Partners and Instagram Partners (like Sendible) offer direct photo publishing to their platform. It’s early days so you can only schedule one photo at a time to your Instagram Business Profile, but this is perfect if you want to streamline your Instagram presence and have more time to grow your audience. However, if you don’t want to switch your Instagram profile to business just yet OR wish to send more than one photo or video, read on. Just like with any other social media network, you will need to log into the Sendible dash and schedule your post. Here, you can write the copy, add hashtags and select the photo or video to go with it. Once it’s time for your post to be published, you will get a push notification on Sendible’s mobile app (available on iOS or Android). This may sound disruptive, but there’s a positive spin on having to publish your Instagram posts manually. First, you can make any last minute changes and use Instagram’s photo editing suite — the text and hashtags will be automatically copied to your clipboard. Second, you can choose whether the new post will be a posted to the Feed or your Instagram Stories (this works on iOS). And finally, you can add tags and a location to your Instagram post. So whether you prefer to have more control and manually push your posts to Instagram OR schedule photos directly to your Instagram Business Profile, this social media management tool will work for you. What’s great is that in addition to Instagram scheduling, Sendible also provides you with data about your top posts on Instagram, follower growth and the best times to post. Additionally, you can manage your stream, read and respond to comments and monitor specific hashtags. This A.I. driven tool is easy to set up, so you will have no problem adding your social media accounts. Once you connect your Instagram profile, you will receive notifications of any new followers you gain, as well as of those you lose. If you have followed a user, but he or she neglected to return the favor, this program will automatically unsubscribe you from that account. With these features, your contacts will always be relevant and organized. Crowdfire can suggest hashtags to bring more viewers to your page, and even help you monitor the competition so that you can make sure you always have an online edge. With three monthly plans, Professional, Team, and Enterprise, Hootsuite can simplify your social media experience and expand the reach of your brand on Instagram, although services like Sendible offer a far superior offering to Hootsuite. 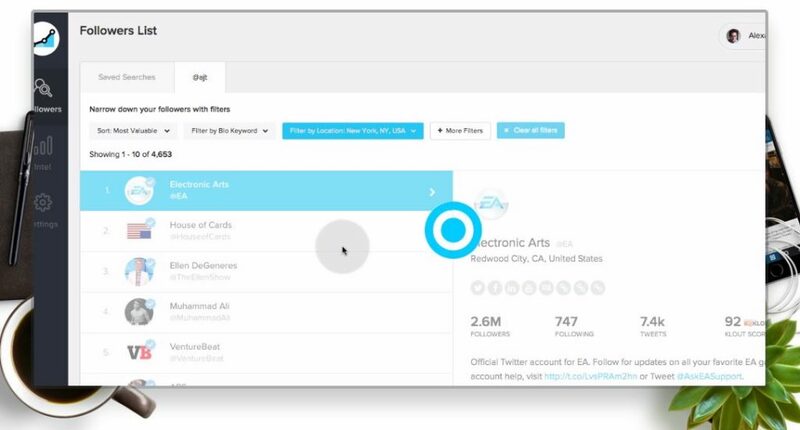 From its convenient dash, you will be able to examine businesses that are similar to your own. By looking at their existing hashtags and successful posting strategies, you will likely be able to incorporate that into your own marketing plan in order to reach a broader audience. Hootsuite also allows you to analyze the strong and weak points of your profiles, easily reply to customer comments across your social media pages, and schedule posts. It’s worth noting that while you can schedule Instagram posts, you will still have to authorize them, as per Instagram’s TOS. Luckily, this is simple enough; Hootsuite will send you a push notification to approve. Just make sure you have Instagram on your mobile device. 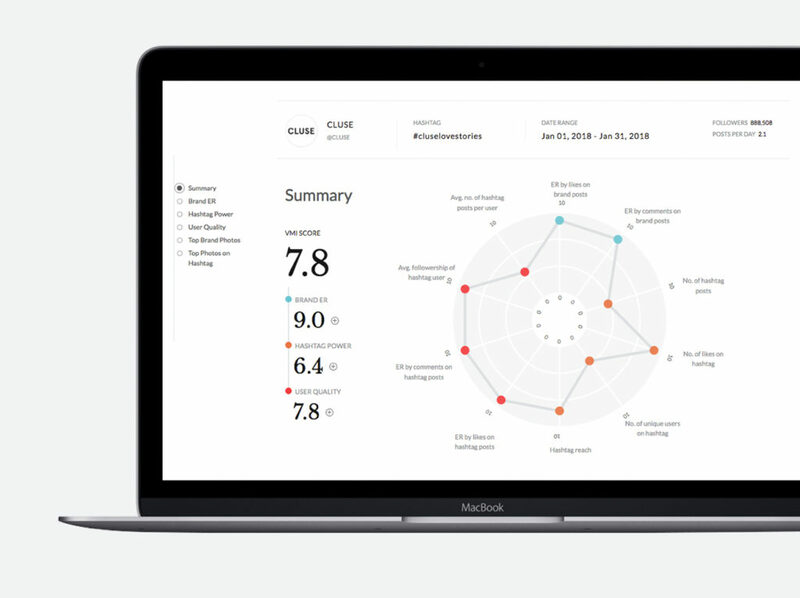 This tool will also help you keep an eye on what customers are saying about your brand, allowing you to improve in any areas receiving negative feedback. The VMI will give you a more comprehensive understanding of how well your brand is performing in terms of engagement rate, hashtag power, and top performing content. The reports are easy to read and present you with insights you can actually use. For example, let’s talk about hashtag power. According to the VMI, this is the extent to which a brand’s main hashtag is used and how much this use pushes the brand’s products to a wider Instagram audience. With these numbers, you’ll have the insights you need to adjust your Instagram marketing strategies and push your hashtag use to its full potential. Offering a freemium option, as well as several subscription plans, Buffer condenses all your social media platforms into one streamlined dash. You can schedule your Instagram posts, which you then authorize through a push notification, obtain statistics on your accounts’ growth, and easily view how your audience is engaging with your brand. It is easy to create a consistent Instagram presence by planning posting reminders for yourself and collaborating with other users or employees who have access to your account. However, it currently lacks that ability for you to interact with your followers directly from its dashboard. 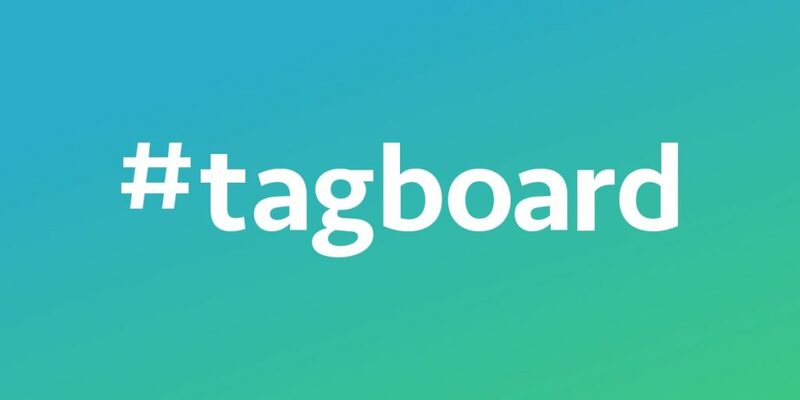 Whether you are on your mobile device or computer, Tagboard is designed to filter through Instagram’s content and identify relevant and popular postings. On the flip side, you can also block sites and users that you don’t approve of so that you won’t stumble upon their content. If you are having trouble picking hashtags for your posts, you can run a search for items similar to that which you are posting and view their popularity. You can repost or share followers’ favorite content, allow multiple employees to access your account, and you will receive an automatic notification if a social media site features you. Tagboard extensions, designed to work with Google Chrome, Hootsuite, and Eventbrite, make it a user-friendly tool as you navigate through the social media jungle. Some add-ons, such as the ability to have polls on your site or run an analysis on ROI, cost extra and each feature must be bought one at a time. Although relatively new to the social media management market, eClincher brings quite a few features to the table for Instagram. Its simple design makes this Instagram scheduler very user-friendly, so scheduling posts, monitoring hashtags or keywords, and recycling your most popular content is a breeze. It includes a basic analytic section for you to monitor how your social media pages are performing, but more in-depth reports require payment. Another feature incorporated into their second-tier and up plans is a unified inbox, so you can respond to messages without jumping from account to account. 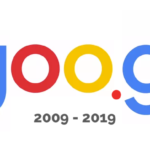 Available in over 30 languages, this internet tool boasts a large Instagram search engine, a user-friendly platform, the capability to respond directly to comments on your page, and much more. The ability to engage with Instagram in such a well-rounded way can be extremely beneficial to building your audience. You will easily be able to find Instagrammers who are interested in topics relevant to your brand, see which hashtags are receiving the most attention, and view an analysis of not only your account but of other Instagram users’ accounts as well. This tool allows you to track, sort, and categorize your followers. Find out who has the most influence on Instagram, who has been actively engaging with your brand and with what frequency, and who the verified users are on your follower list. You can also search for bio keywords, hashtags, and more. All of this allows you to create an experience your followers appreciate and find relevant to their interests. Once you have a handle on engaging your target audience and monitoring your successes, you might want to utilize Instagram to make some actual sales. It is no secret that Instagram itself is a bit lacking in this area; you only get one hyperlink, and that is in your Bio section. However, it offers such a great medium for posting pictures of your inventory that it would be a shame not to be able to allow people to buy right from your Instagram account. Luckily, these tools have that ability to do just that. 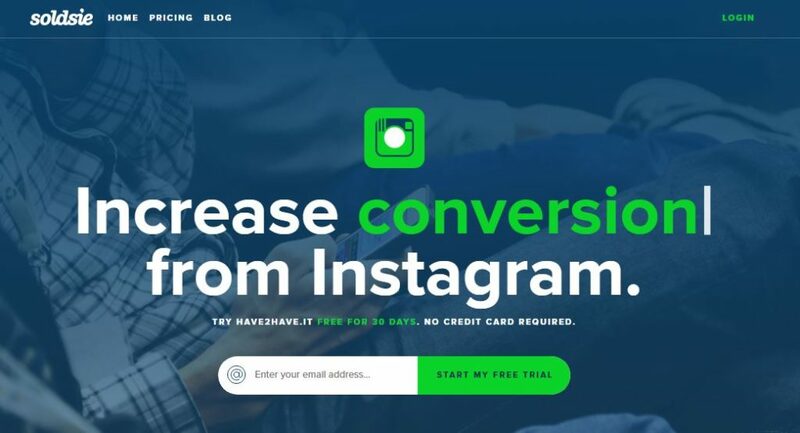 This web-based tool enables you to utilize comment selling on Instagram. 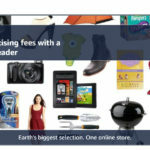 You upload your product picture, along with any relevant selling information (price, size, etc.) and all a user has to do is write “Sold” in Instagram’s comment section. At this time, the buyer will be automatically e-mailed an invoice and can pay their bill. There are transaction fees, which go down as you purchase higher plan tiers, and it’s worth noting that Soldsie will not mediate any purchase disputes between buyers and sellers. Accredited by the Better Business Bureau, this app allows users to buy straight in Instagram’s comments. You come up with a hashtag for each piece of merchandise, which will be followed by a Boost-provided 3-digit number to ensure its uniqueness. When you post your product on Instagram, your followers can comment with that designated hashtag from their mobile devices or computers. They are then sent a text to confirm their order, you are notified, and your products are out the door in no time. While there is a fee for sellers, buyers can sign up free to use this service. As well as all the paid Instagram tools on the web, there are loads of free ones to. In this section I’m going to share with you my list of free Instagram tools that will not only help you to grow your instagram following but also help you to manage your accounts, grow your brand on social and engage with your audience. 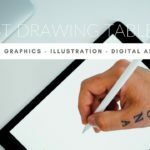 These free tools can help you with photo editing, finding the best hashtags, running Instagram contests, embedding your Instagram posts on your website, and so much more. Note: Some of the tool mentioned in the free instagram tools list have limited features on their free packages. They do offer more features in their premium plans which you can sign up to via our links – these links are affiliate links which means that I get a small commission when you purchase a plan through my links..
Canva is my favorite free Instagram tool. It’s great for creating Instagram stories as they have the exact dimensions for all Instagram image sizes, as well as easy to use design tools for producing images for other social media platforms. Because all the templates are exact and correct to Instagram’s image specs, you can just get on with the design and not concern yourself about trying to sort out issues with aspect ratio, resolutions and getting the right pixel widths. Canva also comes as an app for iOS which means you can use Canva to create images and graphics on the go on your mobile phone or tablet. AutoHash has a very clever vision algorithm that looks at your images and suggests which is the best hashtags to use. Launch the app and then select a photo in your library. The AutoHash app will scan your image, analyze the objects and features in your photo and then recommend which hashtags to use for that particular image. Really smart!! It will also suggest which location based hashtags to use if you have your GPS turned on. Later is a very cool visual Instagram scheduler tool. It has become a very popular marketing platform for Instagram over the past 12 months. This tool does have premium plans which give you more features to use, but the free version is great for individuals. On the free plan you can schedule a maximum of 30 images per month and get access to the basic analytics package. Hosting a giveaway contest on Instagram is a popular way for companies and brands to increase audience numbers and encourage more engagement with their brand. ShortStack is a wonderful a tool for quickly organizing user-generated content (UGC) contests. This is where participants can enter a giveaway contents by posting a photo with your specially selected hashtag on Instagram, which is associated with your content. ShortStack will then gathers up all the images that have been posted on your content hashtag and display them. 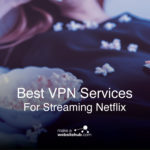 The service is free up to 100 entries. If you want more entries then you will have to upgrade to the more advanced plans. I get asked a lot of questions via email regarding Instagram Tools and Social Media Management Tools, so I thought I’d add them here and try and answer them as best I can. If you have any further questions that aren’t listed here, then please feel free to drop me a line in the comments. What’s the best instagram scheduler? In my opinion there are two that I can recommend. Sendible has an excellent Instagram Scheduler built into their platform which you can trial for free here. You might also want to check out eclincher which I have included in this run down of the best instagram tools. Buffer also has a very good Instagram scheduler. As the demand for a more streamlined and versatile social media managing experience grows, companies are taking notice and creating some great platforms. Anyone of these tools is sure to cut the time you have to spend organizing your social media sites in half, leaving you free to expand your business and maintain an active personal life. 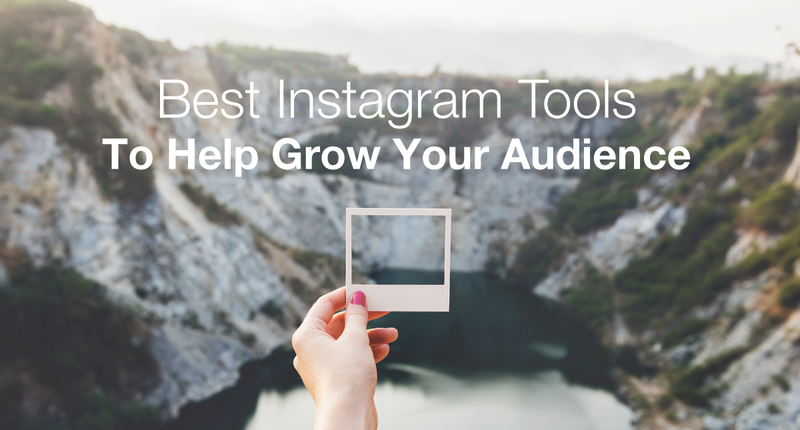 Whether you are looking to monitor trends, grow your audience, or sell your products, we are sure one of these Instagram tools will improve your social media presence. Instagram is getting bigger and bigger by the year, especially for businesses. Jump on this platform now, as its exactly the right time to do so. Instagram has more users than Twitter and are constantly releasing new features that will help businesses reach new audiences and increase engagement. Some good tools I must say, I am currently using buffer for my business and it has given me great results, although reviews of all other social media tools are good over the web and if we talk about Instagram then Soldsie is another tool that people can use. 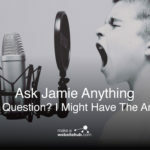 Thanks for sharing such a good list Jamie. Glad you’re doing well with Buffer! Tools like these really do take the hard work out of building an audience on social platforms. Frees you up to do other stuff, which is vitally important when running a business. Great list! Have you heard of Phlanx? It’s an influencer marketing platform. I have been using it for quite a while now and I can say that it helped my business a lot. I’m into fashion niche and I do collaborations with influencers to boost my products. I really like their influencer directory where you can find a list of famous bloggers and also their collaborations portal where I can post collab opportunities and find for the right influencers to work with. Plann is a really cool Instagram scheduling tool that I think is worth a mention too! Awesome list. Would definitely recommend Social Report—a super affordable social media management and scheduling tool that has a marketing partnership with Instagram. 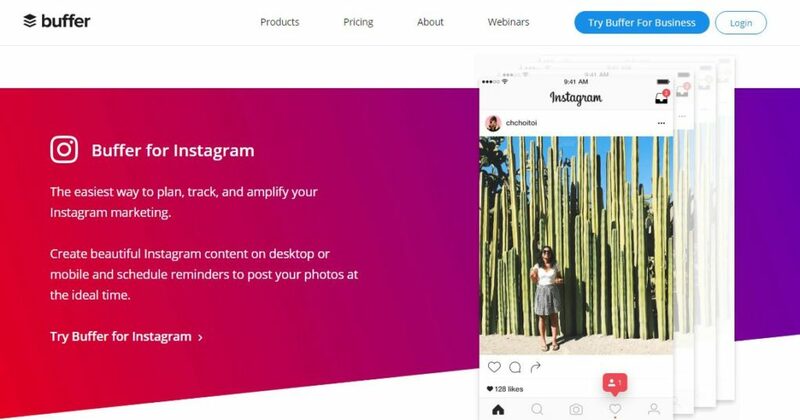 They were the first tool to officially offer direct-to-Instagram video scheduling, as well as unique features like Instagram Grid Preview and scheduled hashtag comments.